Victorians are being urged to stop underestimating the effects of extreme heat as temperatures soar into the 40s later this week. Extreme heat kills more Australians than any flood or bushfire, yet Victorians keep underestimating its danger. Temperatures are set to soar into the 40s in Melbourne later this week, prompting authorities to reiterate warnings extreme heat can kill. "We want Victorians, especially the elderly and those with medical conditions, to stop underestimating heatwaves - they are just as dangerous as floods and bushfires and we need to be prepared," Health Minister Jenny Mikakos said. Paramedics responded to more than 1500 calls of people locked in vehicles, mostly children under 13, between September 2017 to August 31, 2018. Ms Mikakos says it is "disappointing" people are failing to heed warnings it can lead to deadly heatstroke, dehydration and organ damage. "Hot cars can kill. Even if you'll only be a couple of minutes, you should never leave kids unattended in cars," she said. "Temperatures can double in a motor vehicle in a matter of minutes." Ambulance Victoria state health commander Justin Dunlop said last Thursday alone, there were 16 reports of children left in cars. "That's just not acceptable," he said. The weather bureau forecasts Melbourne will reach 38 degrees on Thursday, then jump to 41 on Friday. People are urged to stay cool by drinking more water throughout the day, seeking out air-conditioned buildings, planning activities in the coolest part of the day and checking on the elderly and neighbours. Those at highest risk of heat exhaustion include people over 65, those with a pre-existing medical condition, pregnant and breastfeeding mothers and babies and young children. Early signs of heat stress include cramps, nausea, vomiting, fatigue dizziness and a racing heart, which can all lead to heat stroke. The Bureau of Meteorology's Andrew Tupper says it has been a particularly intense summer. 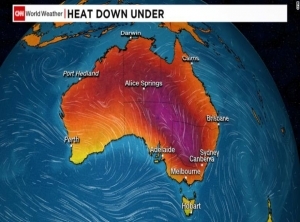 "December was the hottest summer for Australia on record," he said. "The heat wave has continued into January and some of that heat is making its way to the south coast on Thursday and Friday." Mr Tupper says that long term, summers have been getting hotter while the outlook for the next few months is also warmer than usual. During the 2009 heatwave, the number of deaths in Victoria was 374 more than under normal conditions and almost 80 per cent of those deaths were people over 65. During the 2014 heatwave, the number of deaths rose by 167.